Want to stay in touch with the latest ideas and developments in narrative practice? 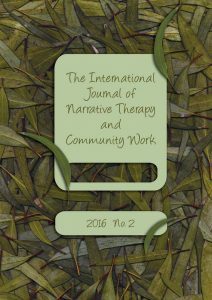 This journal offers hopeful and creative ideas for counsellors, social workers, teachers, nurses, psychologists, and community workers. In each issue, practitioners from a range of different countries discuss the ideas and practices that are inspiring them in their work, the dilemmas they are grappling with, and the issues most dear to their hearts. Their writings are easy-to-read while remaining rigorous and thoughtful. The first section of each issue revolves around a particular theme, while the second consists of a collection of practice-based papers on various topics. The journal is produced four times a year. It costs only AUD$49 to subscribe for the year. And this subscription also enables you access to the ‘Reading Room’ which includes all previous issues of the journal! Copyright subsists in the various forms of work and material on and accessible from this website. Dulwich Centre Publications grants visitors a license to download and display copyright material for private and non-commercial purposes only. For reproduction or use of copyright material beyond this limited license, please ask. Have something you'd like to submit for publication? Click here for more information.